While there are some good features with the PP600E, there are other kits around which offer much more for your money. Sturdy rack. Onboard songs are welcome. Can get more for your money elsewhere. Performance Percussion is a brand marketed and distributed under the parentage of John Hornsby Skewes, that is currently celebrating its Golden Jubilee year. PP specialises in drums and percussion for education and are mainly sited at the starter end of the market, encompassing both small and larger percussion items, through to full-sized drum kits. 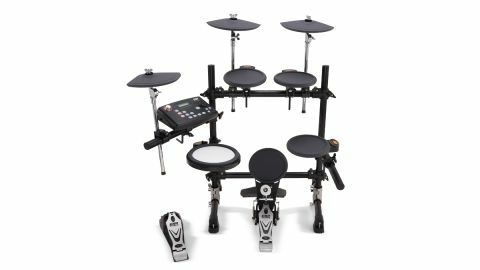 While the review set appears to be comprehensive, it is currently the only electronic kit available from Performance Percussion. This five-piece set-up includes a full-sized rack, pads for snare, three tom pads, three triangular shaped cymbal pads (ride, crash and hi-hat), hi-hat controller pedal, bass drum pad, percussion sound module, power supply, manuals, kick pedal, cabling and a pair of sticks. "Dual zone pads give us the option of acoustic playing techniques such as rim-shots, cymbal chokes and cross-sticking." This whets the appetite; so too does the rack which appears sturdy and robust with its industry standard tubing diameter. This also benefits from a serrated exterior which should provide extra grip to the variety of rack clamps. Also, in a departure from the usual rack wares, the four chunky rubber feet of the two rack stands have adjustable spikes to help prevent the whole assembly from creeping away (or towards), the player on a carpeted area - what a neat idea. The playable/striking area of each of the drum pads is made from a thick rubber compound and finished in black for all pads, with the exception of the snare, which is finished in white. Another exception is the single-zoned kick pad, while the rest are dual-zone, giving us the option of acoustic-like playing techniques such as rim shots, cymbal chokes, cross-sticking etc. This is good news for us drummers as these real kit-like playable facilities are becoming increasingly common on budget e-kits. With 16 individual buttons and control knobs, there is plenty of quick access to the various features this module has to offer. To the rear is an array of individual sockets including Kick, Snare, Tom1, Tom2, Tom3, Hi-hat, HH-CRTL (Hi-hat controller input), Crash, Ride, R and L output, AUX (auxiliary input - for iPod, MP3 or CD player), USB, MIDI in, MIDI out, DC In. To the side is a 3.5mm headphone output which when inserted doesn't cut the main output. The rack virtually unfolds from its box and is then slotted directly onto the two horizontal feet. Each pad and drum module are then attached and cabled up - a process which only takes a few minutes. Then, of course, it's the usual fiddling about positioning each pad. The clamps of the L-arm brackets are basic but make the whole set-up feel secure, creating a confident performance platform. Firing up the module shows a brief copyright display - the system defaults to Preset kit 1 and the volume control and reverb (set to active) are both highlighted with red LEDs. There is an annoying high frequency noise or hum from the reverb - luckily this is only audible when the kit isn't being hit or if the reverb is turned off! As we strike up the first of the pre- programmed songs, we can't help being impressed with the song construction. Though they are of the sort you would normally hear in an airport lounge or an elevator, we are sure the choice will prove good introductory material for any beginner. It is a pity there are only 10 of them but, by taking advantage of the USB connection (of which there's little mention in the manual), for any third party backing tracks or the aux input for your own audio device etc, after a week or two, the user probably won't worry about the lack of selection. As the data wheel is turned, it gives a welcome reassuring click as it increases or decreases each parameter change. The volume, however, feels quite stiff to turn, especially as the level is increased, it simply becomes progressively difficult to turn. Once we have a quick play around the kit, we are pleased to find that the kick is indeed velocity sensitive which enables a reasonable dynamic performance. Going through the manual we find some amusing Chinese/English translation issues, ie: "Press [DRUM KIT] constantly" which actually means 'Hold down [DRUM KIT] button'. Once you suss these and other anomalies with a little common sense interpretation of your own, using the kit is actually quite intuitive. The snare sound suffers from the dreaded 'machine gun' syndrome of distinctive, regular beats, rather than a random real snare sound. Here the dynamics also suffer as it's necessary to keep up the force from the sticks in order to coax a sound when using the default settings. Adjustment does give the pad more sensitivity but there is some cross-talk if taken to its maximum. With the default 'kit 1' there is a cross-stick sound on the rim which we change to a rim-shot to produce a decent snare sound and save this setting (along with any other changes) as one of the 10 user kits.